BTW Serbia – March Update! In preparation for Mohanji’s arrival to Serbia in mid April (gratitude to Miona for the beautiful design of the flyer 🙂 ), our meditations in Novi Sad and Belgrade have been progressing beautifully – I’m happy to share with you some lovely BTW news and updates for the month of March. 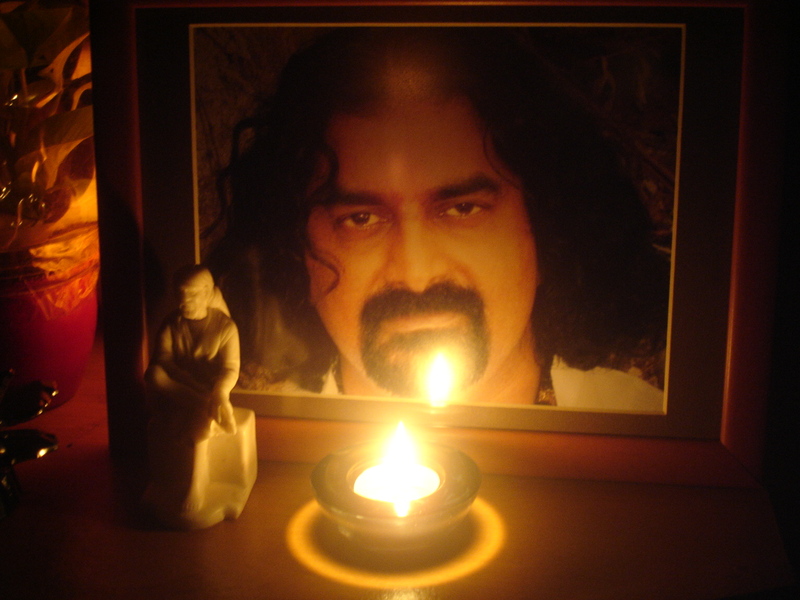 A small sharing to start with 🙂 – During one of our meditations in Novi Sad in early March, for the first time, I felt like bringing Mohanji’s photo and put a candle in front of it. I did not give any explanation about its effect to people, because I was not sure whether this very concept of a photo would go well with the cultural conditionings in my country… However, to my great joy, one lady approached me right after the meditation and said: “I’m so glad you put Mohanji’s photo there – the moment I looked into his eyes and started the meditation, I could feel some vibration on my forehead. It continued throughout the meditation and increased its depth manifold. I’m feeling something like this for the first time!“ So there we go – the photo is now in for every session :-). 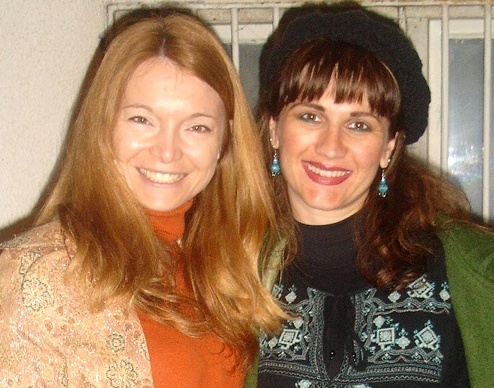 My days in Belgrade have been really beautiful – the spring is on and I’m enjoying the walks, meeting up with the friends, and attending the weekly meditations. 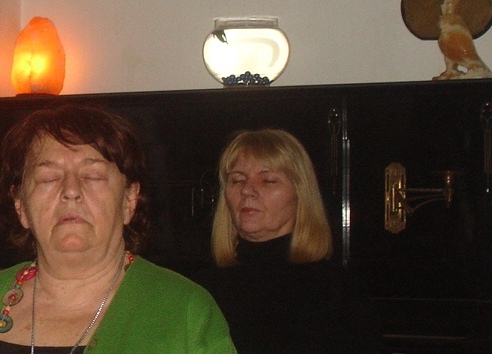 Our BTW meditation in Belgrade on March 24th, I must say, was one of the MOST INTENSE EVER (at the same time, the 360 Degrees meditation was on in Muscat). All present had a very deep experience – the energy we experienced was so intense and cleansing effect so deep, that we needed some time to ’gather’ ourselves. Several people reported very deep plunges into the absolute silence within, as if getting ’spaced out’ or going into deep sleep, and some could feel PHYSICALLY how the negativities were leaving their system. One lady had a very touching encounter with the soul of her mother, whom she missed deeply ever since she died years ago. Another lady, aside from the living friends/family members who kind of line up for the blessings (usually flowing from the right to the left), this time saw (before her inner eye), for the first time, a long, long queue of already departed souls of the ancestors and people she doesn’t even know – they were all, as she said, ’flowing from the left to right, lining up for the blessings quietly’. It was a real scene to behold! – Shelter, i.e. an opportunity to rest for a day or so and spend some well-structured time under supervision of the educator/volunteer who conducts creative, skill-imparting workshops. 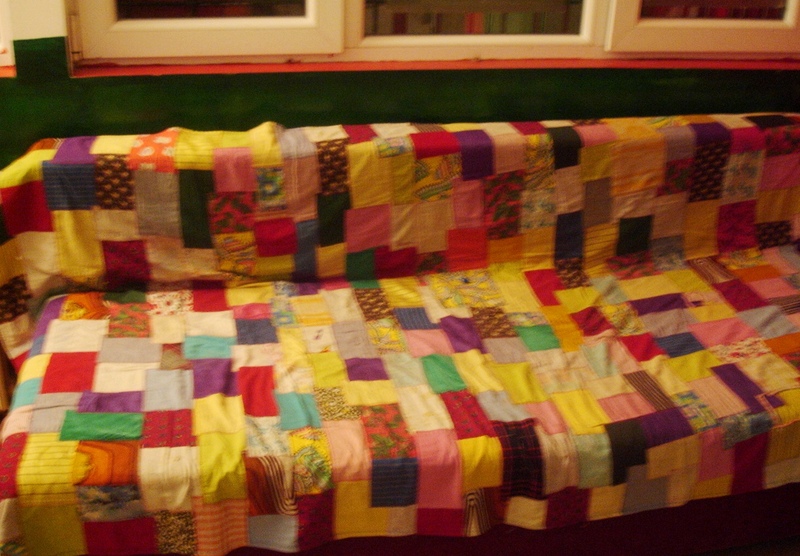 – Basic education and skill training, which will come handy to children as they learn to lead an independent life. All in all, even though the daily reality of these children is cruel, the very thought that all of us have a chance to shower them with love, fills the heart with great joy. It is our hope that more people will feel inspired to dedicate their free time to selfless service, as it is our honor and blessing to be in a position to serve… All spiritual Masters, throughout the ages, continuously remind us that “Hands that serve are holier than lips that preach“, and that our spiritual evolution can’t but happen through Love, which must be experienced and radiated in our daily lives, not just in theory. 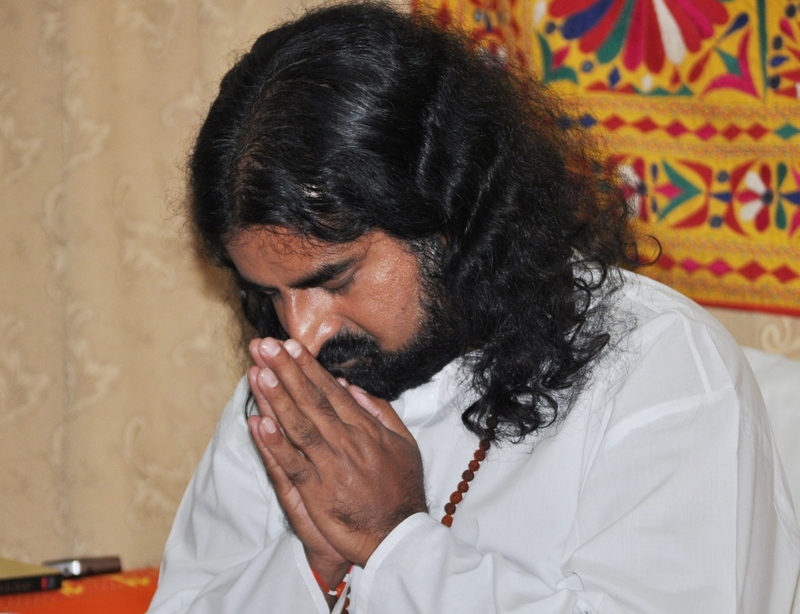 Let us find our own ways of coming out of the lethargy which comes as a result of stress and daily rush, to value our free time as a precious opportunity to serve and express Love – towards people, animals, plants, nature…. With Love from BTW Latvia in Riga!! 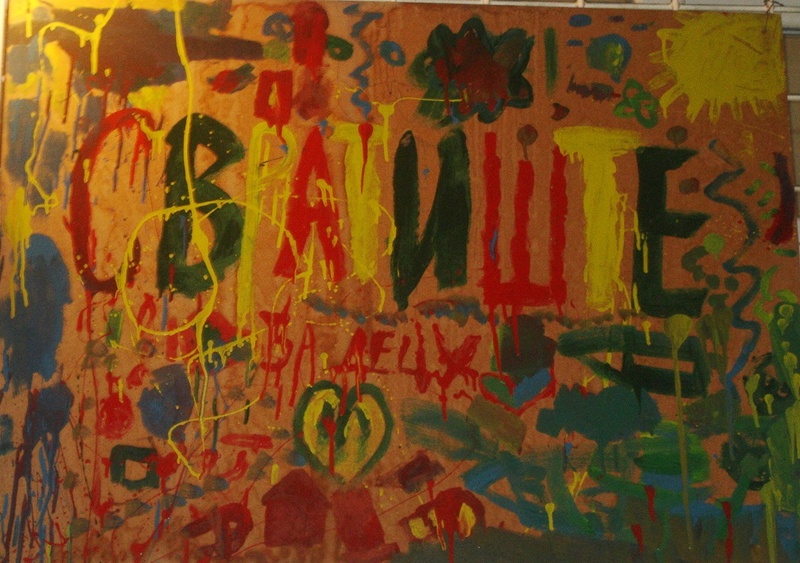 A new blog is started: http://btwlatvia.wordpress.com/ !!! It is with great pleasure and heartfelt joy and gratitude that we announce the creation of a wonderful new blog in Russian dedicated to Bless the World, Mohanji and associated charity activities. 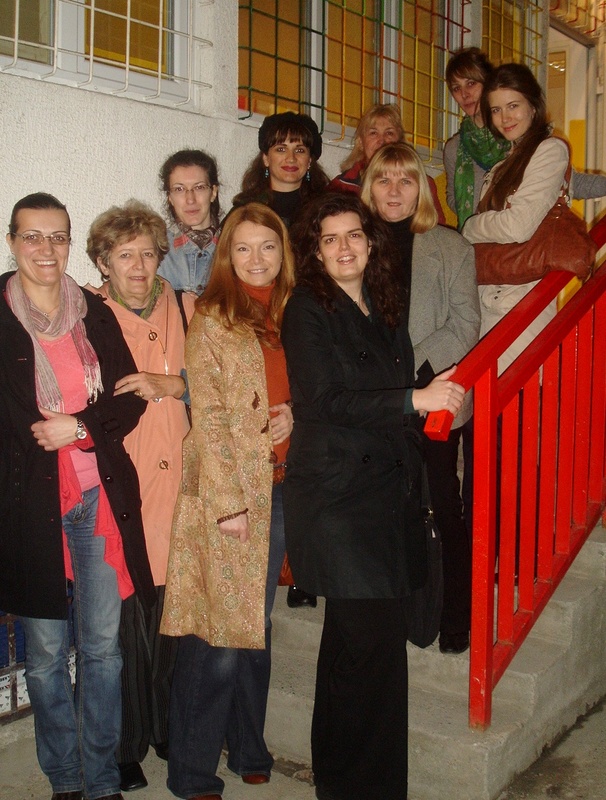 This project was birthed into being by a loving team of BTW Family members from Latvia and Ukraine. Indeed our BTW Family is growing faster than ever, as more and more people from all around the world resonate deeply with BTW’s human and spiritual messages. Kindly read on and discover the story behind this wonderful and graceful expression of service to all. Andris Ceirans was born in the Baltic state of Latvia. He lives and works in Riga, in Latvia. Andris works in the field of logistics. 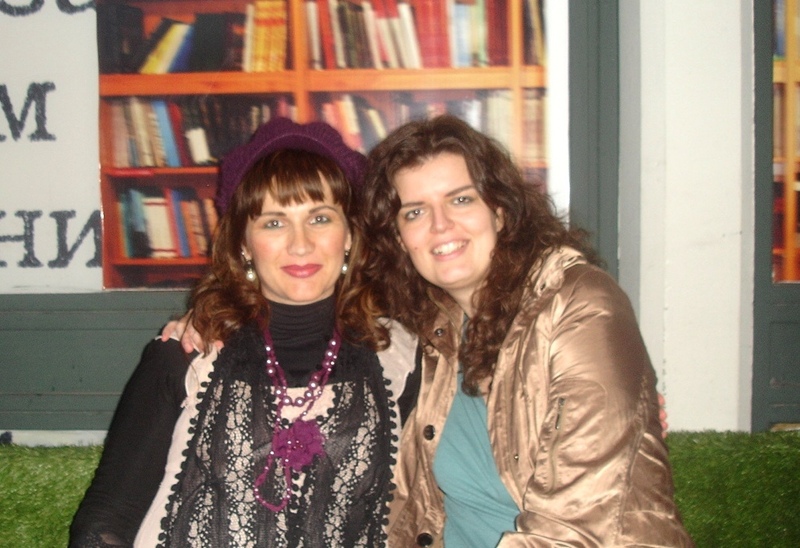 Daina Gribonika also lives in Riga where she works in a bank. Both Daina and Andris are also practitioners of Yoga (mostly Hat-Ha). Riga is the capital and largest city of Latvia, a major industrial, commercial, cultural and financial centre of the Baltics. 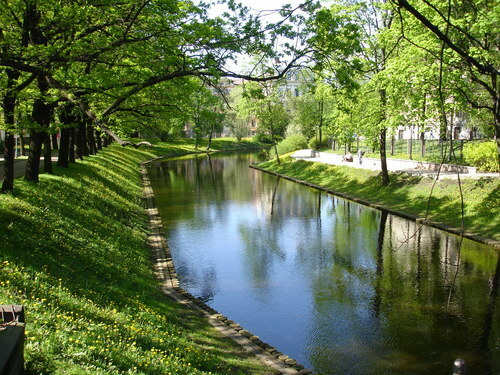 With a population of almost 1 million, it is the largest city of the Baltic states. 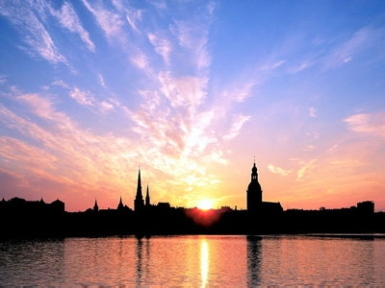 The climate of Riga is humid and continental. The coldest months are January and February, when the average temperature is −5 °C. The summers in Riga are warm and humid with an average temperature of 18 °C, while temperatures on the hottest days can exceed 30 °C! “I met Mohanji in April 2010, in Hamburg, at the annual business meeting of an association our respective companies belong to. While sitting around a table of 8 people on the first evening of the Hamburg meeting, after some 40 minutes of business talks (on developments, cooperation between agencies, etc…) I suddenly asked a question to the others: “Business is wonderful, no doubts! But, how much do we all need to be satisfied in our lives? I was in India and saw very poor people smiling! So, why are we sometimes so greedy, always striving for more…?”. Mohanji happened to be sitting at my table (out of some 20 tables!) and was actually seated on my right. And that, for me, is where the story began! 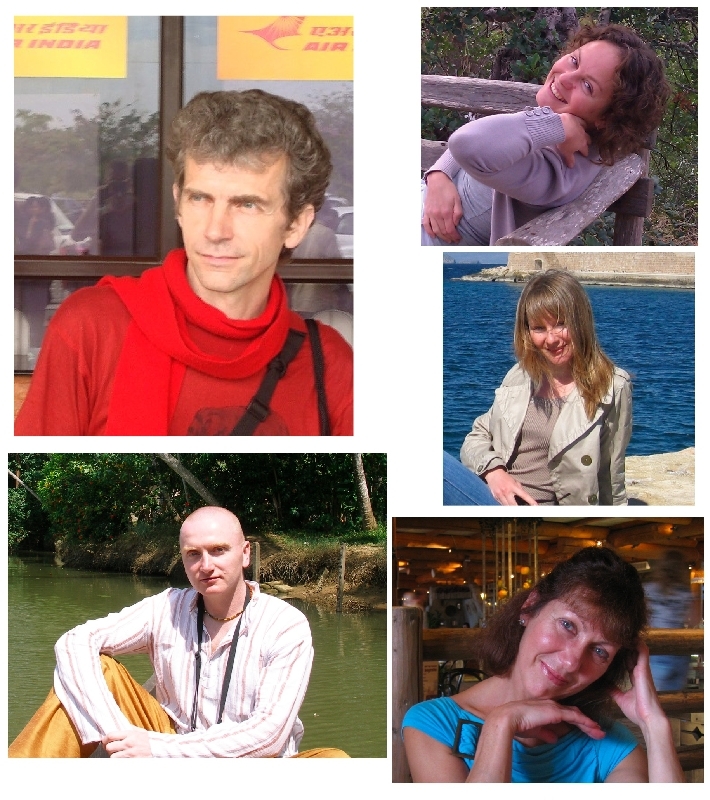 Although initiated by Andris and Daina, the project would not have been possible without the participation and assistance of their team members. 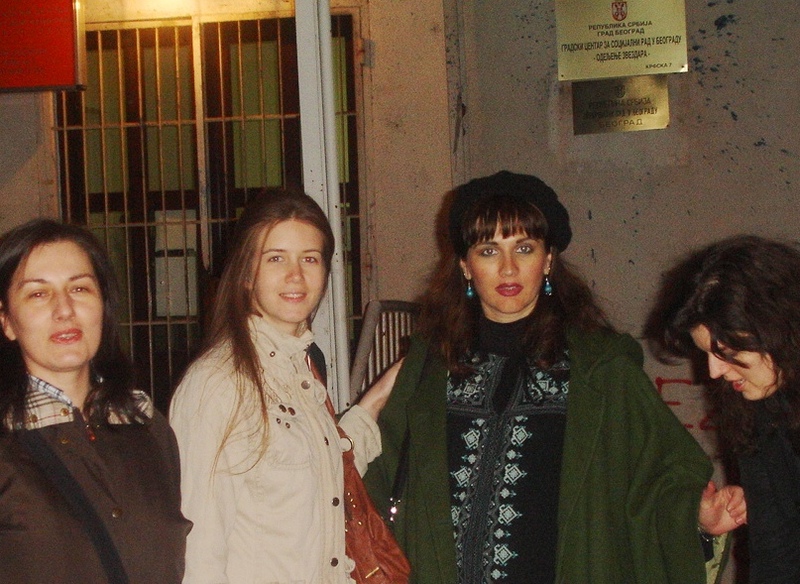 These include Karina Gribonika, Daina’s younger sister, who provided all kinds of assistance; Anna Gribonika, Daina’s mother, who checks the Russian versions for mistakes and edits where necessary; Maris Sverns, a man from Latvia, whom Daina and Andris have not actually met yet, but who encountered Mohanji’s website, got in touch with them by phone and offered his assistance to do additional error monitoring in the Russian texts; and last but not least, Alexander Zhalkiy, a friend of theirs from Ukraine, who offered his programming skills and assisted them with technical web matters. The Bless The World Team would like to extend their deepest, heart-felt appreciation and gratitude to Daina, Andris and all their team members for their hard work, efforts, devotion and dedication. May their desire be fulfilled and may their work contribute to bringing understanding, clarity and peace into the lives of many. Over the last few weeks, my hospital work including patient consultations, lecturing to medical students and organization of student exams has kept me so busy, that I was absent from the web and could not pen down the happenings here. But to tell you the truth, it is actually very difficult to capture Mohanji’s energy in pen. Believe me, it is extremely intense and beyond terrestrial expression and understanding. One needs to experience it. On the day of Mahashivaratri, the most auspicious day dedicated to Lord Shiva, we all gathered at Mohanji’s place but did not do any meditation. 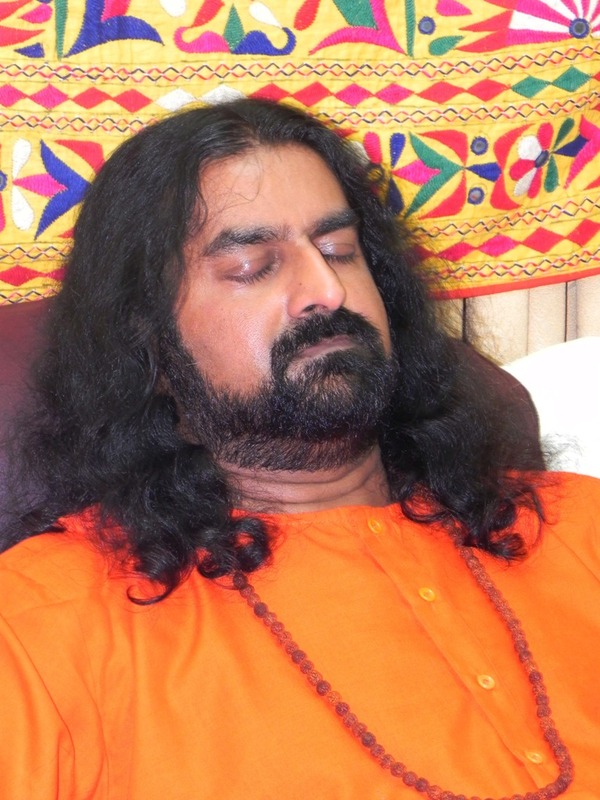 In reality, meditation was not necessary; sitting with Mohanji was enough to experience the all-encompassing energy. He is working on us anyway. Mohanji is working on all those who are connected with his eyes; that’s for sure. 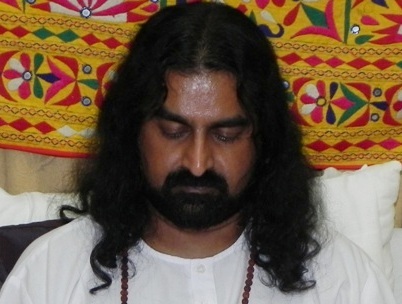 Meditation is merely a means to get connected with him. We just sat there to offer deep gratitude for Mohanji being on earth to guide us. All of us certainly feel the difference in our lives. He is the difference. His presence is the difference. He has given the much needed purpose to our lives. He has given clear understanding of our own life. 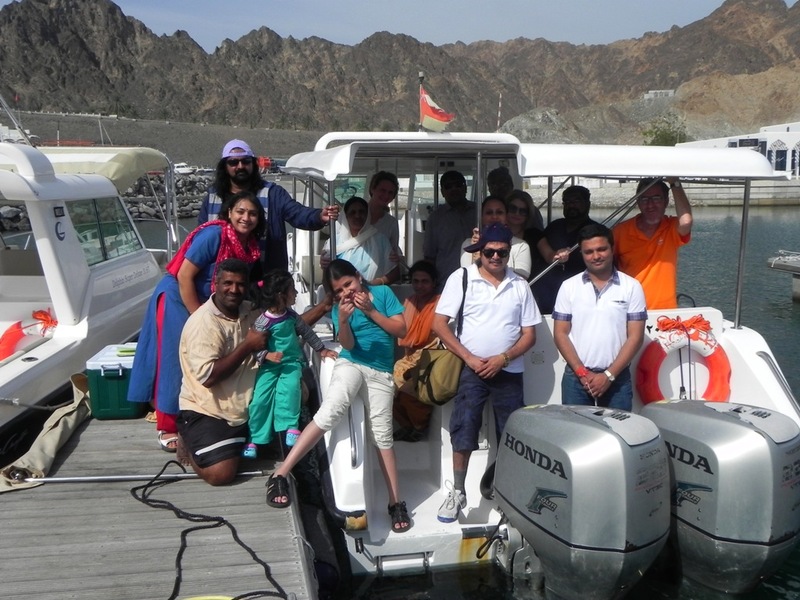 We experience his grace every moment in our lives, whether it be Murari, Peter, Caroline, Moushami, Sanjay, Pratap, Murali, Steve, Lara, Smilijana, Rajdeep, Firoz or Ravibhai and many more here in Muscat. More and more people are also joining day by day. We all feel Mohanji’s energy getting intensified. At times, he is so expanded that he cannot even get up from his seat and walk. He remains in a trance state for hours and sometimes days!!! He still works for his living and manages both the contradictory as well as demanding worlds with reasonable ease and effortlessness. Sometimes, it is really taxing for him, we can see that. We do the ‘Power of Purity meditation’ every Thursday. It may sound monotonous that the same meditation is being repeated every Thursday! But, let me tell you, what happens during the meditation is absolutely unique each and every time. We all feel the Shaktipat reaching deeper and deeper layers of conditionings. With every Thursday meditation we are settling in a different plane of existence. Definite software changes or upgrades are taking place, which gives more clarity and efficiency to our operating levels. Our emotions are directed towards our life’s purpose. Although we are doing the same office, house and social work, there is a different clarity and smoothness. Problems do occur but with Mohanji’s grace, their intensity is much less. We all have come to this earth with our own agenda and we need to go through that. But this process of going through the agenda has become meaningful and is happening with good clarity with Mohanji’s grace. Meditation on Thursday 10th March, a day before the Japan earthquake and tsunami, was intense. That day’s meditation went into deeper layers for everyone. It was also, in a way, disturbing for a few. There was intense energy and Mohanji was dead serious and unsmiling!!! Mohanji was visibly different that day. I thought he looked a bit upset at something, perhaps angry or aloof. Usually, after the meditation and Shaktipat, some of us bow down and touch his feet in reverence and gratitude. That evening, Mohanji did not let anyone touch his feet. “One might burn with the energy. Let none touch me today”, he said to me. We all found it strange. But we had to accept. He always has his own reasons, which are beyond our comprehension and awareness. Prior to every meditation, we usually bring the idols and statues of various masters from Mohanji’s bedroom shrine to the meditation hall. Either myself, my daughter Moushami, or Mohanji himself do that. After the arati and meditation, we take them back to their original place. We do this “ritual” every Thursday. After the meditation that night, Mohanji quickly had his dinner and abruptly went upstairs to his room, even before people had finished their dinner. He just got up, visibly in trance, bowed down to all, and went upstairs. Moushami went to place the Baba idols in Mohanji’s bedroom shrine; she saw him sitting at the altar, staring at the pictures of various Gurus. His eyes were red and almost like he was crying. Mohanji apparently sat in that position for almost 3 hrs! Something prevented us from going upstairs and bidding him good bye. Usually, if he leaves the meditation early, we go upstairs and say bye to him. On this day, we could not bring ourselves to do that. Something told us not to disturb him and that he was not in his body. He was out for some mission. And then, on Friday we heard the news of the disaster in Japan. When I called him in the morning to tell him the news that almost 40 people had died, he said “I know. It is not 300, it is almost 12,000. He had known it already. He was there!!! For the next 5 days, Mohanji did not sleep. He said, “I have lot of work”. Our communication with him was very short and abrupt. He was becoming dehydrated very often. In that expanded state, he was not able to walk properly, but he had to go to the office. He said, “I am only 30% in my body!” Only he knows where he is and what he is doing. We only enjoy the manifestations of his grace. Mohanji did not write or communicate through his blog or the group about this incident. All he said was “Do not worry. All those who left will not be sent back to earth. They have been dissolved, and in a way, liberated. The shift is happening. Shift of consciousness. When the house cannot be repaired anymore, it should be demolished and re-built”. 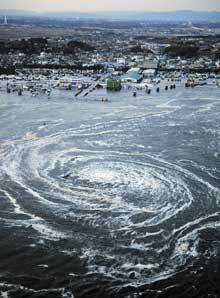 Many must have had premonitions about the tsunami. Masters take the decision of what must happen and where. Their plan is too precise. That reminds me of two interesting stories of Sai Baba and Shankar Maharaj. In Sai SatCharita, chapter XLIII, there is a story of Baba leaving the body for 72 hrs. This happened in 1886. All declared him dead, but Shama and Mhalsapati protected Baba’s body. Baba gracefully returned after 72 hrs! This miracle changed the attitude of many devotees. Plague was rampant in those days. Such is the great tradition of Dattatraya! 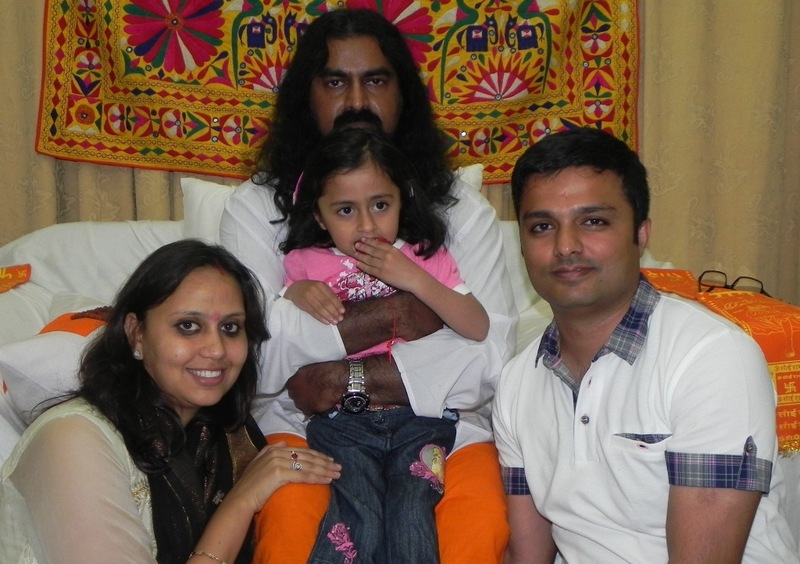 Sumit, his wife, Sakshi, and their lovely daughter Swasti visited Muscat in March. It was their deepest desire to be with Mohanji. Sumit had physically met Mohanji only twice up until now. He was initiated into giving Shaktipat on his second meeting with Mohanji in Delhi (Oct 2010). 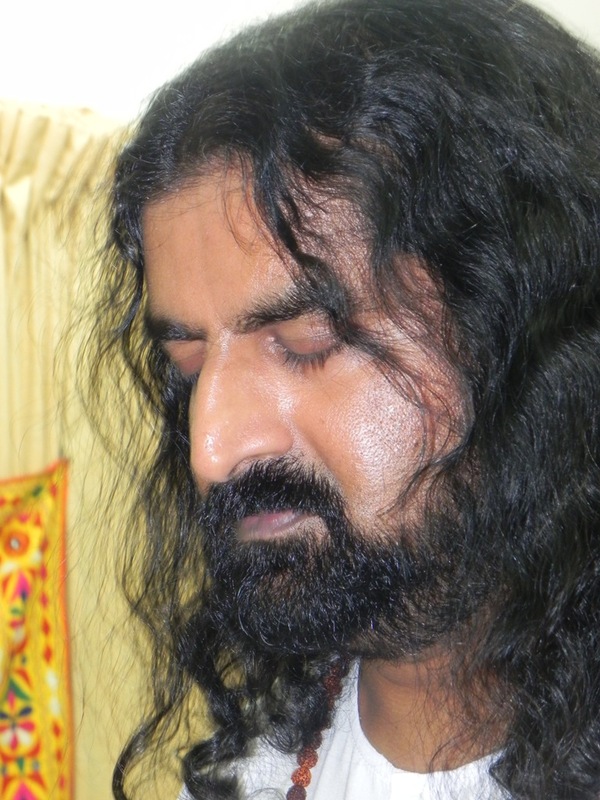 Sumit has met many spiritual gurus and has traveled many spiritual paths in this life time. So has Sakshi. When Sumit met Mohanji, he knew that he had finally found his path, destiny as well as destination. Everything became clear to him and many signs of reconfirmation followed the meeting. Sumit is driven by Mohanji’s practical message of selfless service and unconditional love. He now realizes that this is the mission of his life. You have all read about his selfless service in 2 earlier blogs. Interestingly, this was Sumit and Sakshi’s first trip outside India and he refers to visiting Mohanji as a “Visit to the Divine and to the Source”. Dear Sumit, you are fully satisfied and your joy has no boundaries after meeting and being with Mohanji. We Muscatians are happy to have met you too and have taken the message of selflessness from you. 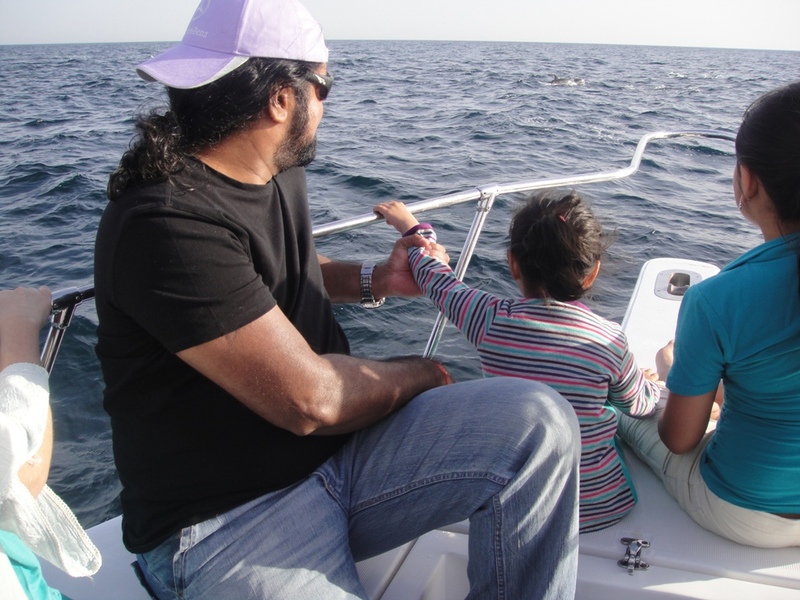 We organized a Dolphin watch cruise for Sumit and his family. A few members of the BTW Muscat family also joined. 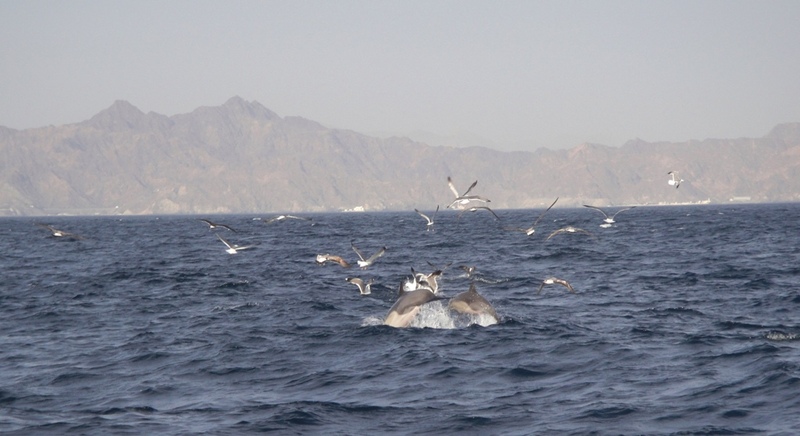 The most wonderful part of the trip was the way hundreds of dolphins gathered around our boat. We saw thousands of dolphins swimming and twirling in the sea. They surely responded to Mohanji’s call. It was indeed a beautiful gathering. Peter, who had been out dolphin watching just 2 weeks ago, said, “Today there are certainly more dolphins. Thanks to Mohanji’s grace”! “Oh Gurudeva, You are my guide, my pillar of strength. My existence depends on you. You should lift me up, guide me, and protect me from delusions, illusions, maya and ignorance. You are the giver of wisdom, you are eternal. Do not leave my hand, Forgive my follies and cover me in your eternal love and compassion. 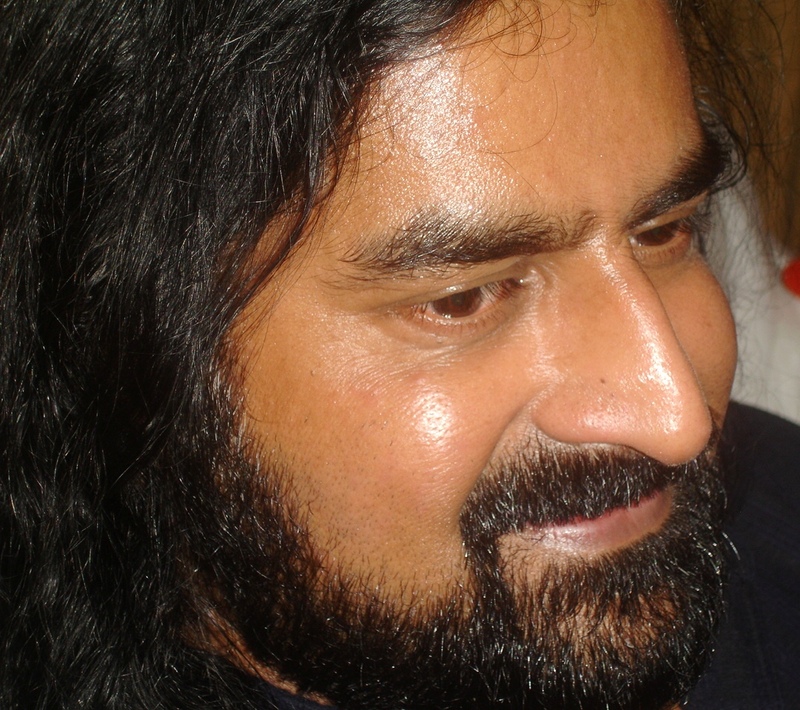 Gurudeva, you are beyond gunas, time and space. Raise me up to your stature. Gurudeva, my existence depends on you. Without you, I do not exist. Bless me, bless my path, discover me from the ocean of existence, and guide me to complete liberation. I am only one of the mouths in the ocean of existence. If my existence helps other beings to see light, I am blessed. If my existence as a bubble dissolves without a purpose, please discover me again and make me useful. 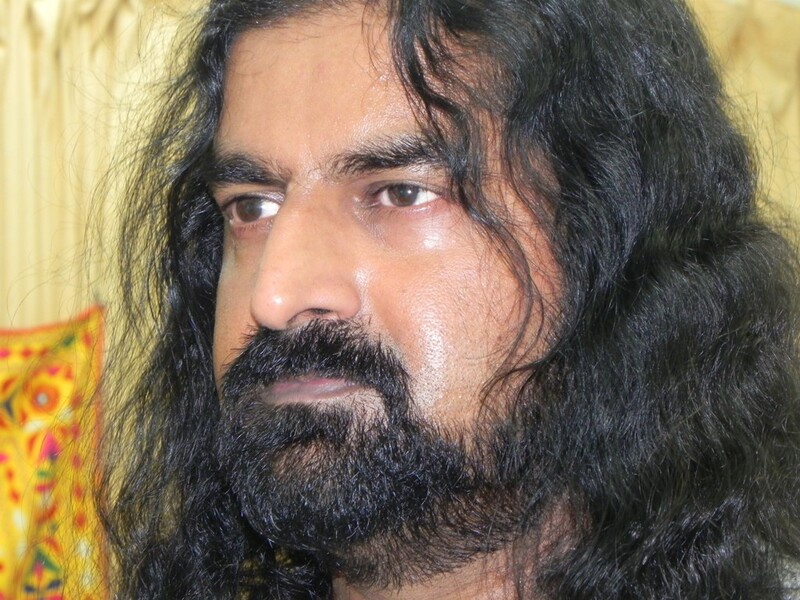 My existence is surrendered to you, oh Gurudeva. I fully and completely surrender my self at your lotus feet”. This was indeed intense. Since Shivaratri, Mohanji has been in intense, Shaivic energy mode. That was intensified on the Holi Full Moon day. 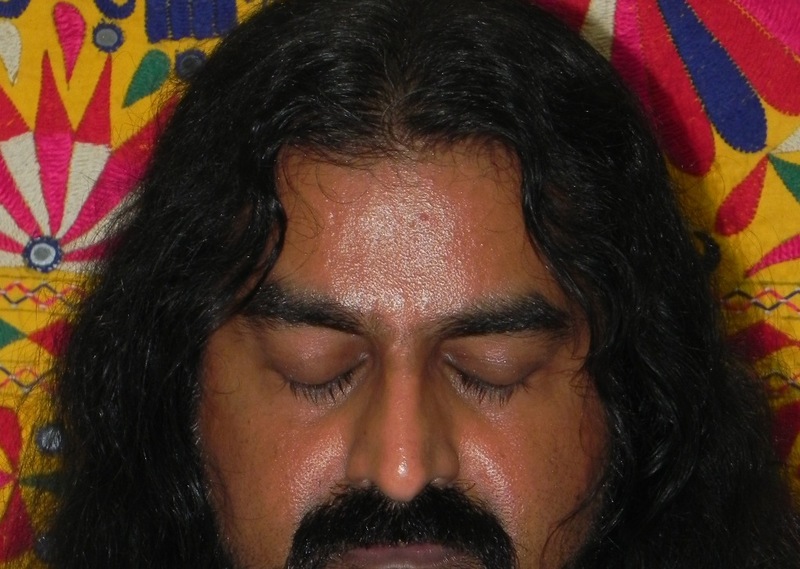 Attached is his picture showing purple energy all around his Rudraksha prayer beads and his hair. The vibrations of Mohanji’s energy are felt by all those connected with him, all over the world. 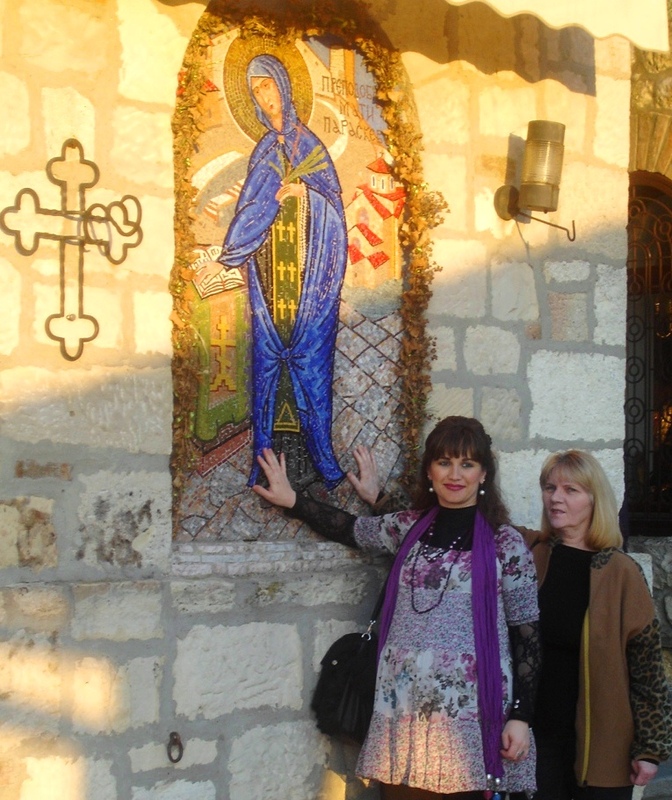 Biba is in Serbia at present. 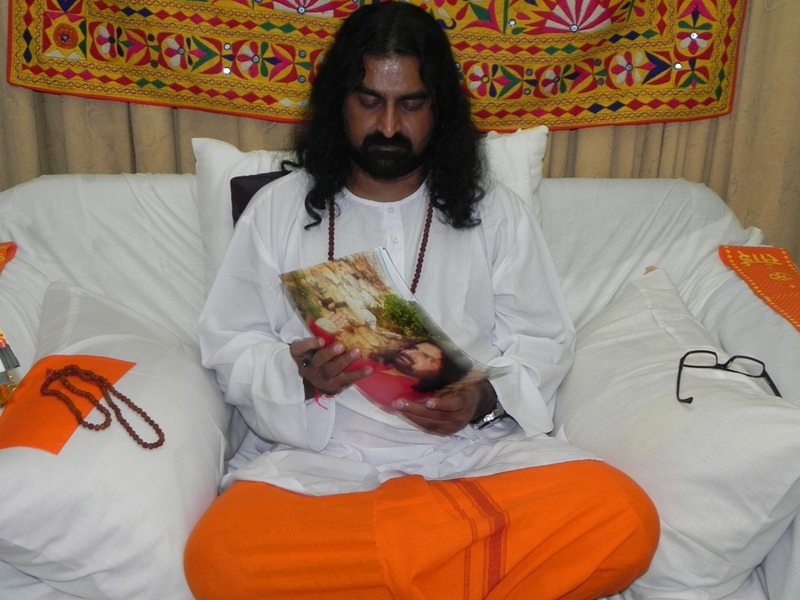 Meditations have been conducted there regularly as well as those of Marina in Germany, Daina in Latvia, Pradeep in Dubai, and Mohanish, Sumit, Rajeshwari, Shahid and Aprana in India. 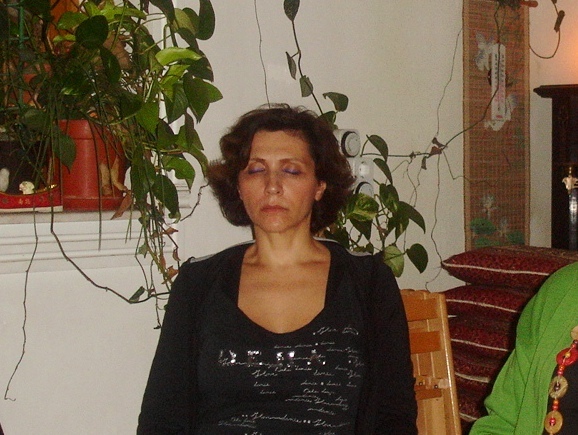 There are many who are doing meditation on their own and have been sending us the testimonials. On the day of Holi, after reading the announcement in the Yahoo BTW group; Bridget, Siew Hoon, Kate and their group in Malaysia conducted meditation and conveyed that, they had never felt so intensely peaceful. They clearly felt Mohanji’s presence too! Many have also been experiencing Mohanji’s physical presence in different locations around the world. Here is a story to explain this tangible dimension: Guru lyer went to Shirdi last week and could see Mohanji with him from the morning till the afternoon. He asked, “Mohanji, where were you in the afternoon?” Then, Sudeep sent an SMS from Thane, India “Mohanji thanks for being with us in the afternoon. You were clearly present with me here.” Guru Iyer clearly saw him again in the evening in Shirdi, while we were all talking to him in Muscat!!! Sumit vouches that he has seen Mohanji many times in Jammu and during this trip, both him and Sakshi saw and experienced Mohanji’s hand, many times. When Sumit is giving Shaktipat, people feel two hands! This is difficult to comprehend, but it’s the truth. Amazing! There are many more stories like this one.